A symbol of liberty, victory and power, this bird of prey with finely chiselled feathers is accentuated by the gleam of the satin-finished amber crystal. 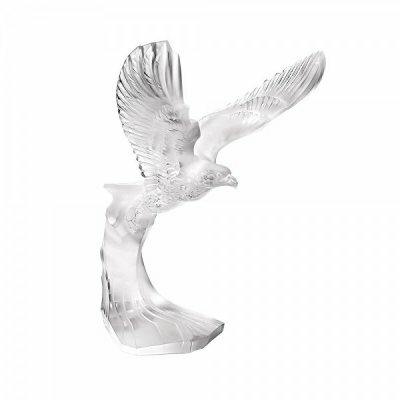 LIBERTY EAGLE SCULPTURE LALIQUE, Since ancient times it has been the symbol of victory; that is why the Persians placed it high in their standards. The Romans considered it to be the messenger of the gods, and the bird of Jupiter (the god of earth and sky). For the Aztecs it represented the sun and its path and some Native American tribes used its feathers for their headdresses when going to war. The latest Lalique collection pays tribute to Nature, an inexhaustible source of inspiration on which the Lalique identity was built. Wild jungle versus urban jungle: the satin-finished crystal bestiary matches the poetry of a dreamlike vision of Parisian flora. The power of the Lions, Rhinoceros, Gorilla, Crocodile or Hippopotamus contrasts with the lightness of a whirlwind of leaves that defy gravity. Designed by Marc Lalique in 1951, the iconic Champs-Élysées bowl, homage to the «most beautiful Avenue in the world», is transformed through new sizes, colours and uses. The precision of the design echoes the purity of crystal, fashioned by the hand of the best artisans from the crystal factory. Lalique exhibits its exceptional savoir-faire in each creation. The halls of our ateliers resonate with a passion for craftsmanship, the love of beauty and devotion to excellence. Sculptor of light, Lalique crystallizes Nature and invites us to admire its beauty.